While in Brazil, we discovered that Gauchos roam the pampas (broad open plains) and the Pantanal. Morah Katie: Where else did we meet gauchos? We learned that Brazil grows 2 very popular plants. Morah Katie: IF we went to the store and there were no oranges for us to buy, what country could we travel to in order to buy more? Morah Katie: If we were to bring back a souvenir from Brazil, do you think your mom and dad would enjoy COFFEE? Morah Katie: As would I. During snack we enjoyed sweet oranges and smelled coffee. Amelia: I do not like the coffee. The oranges smell better. Sroli: We need water for our coffee. 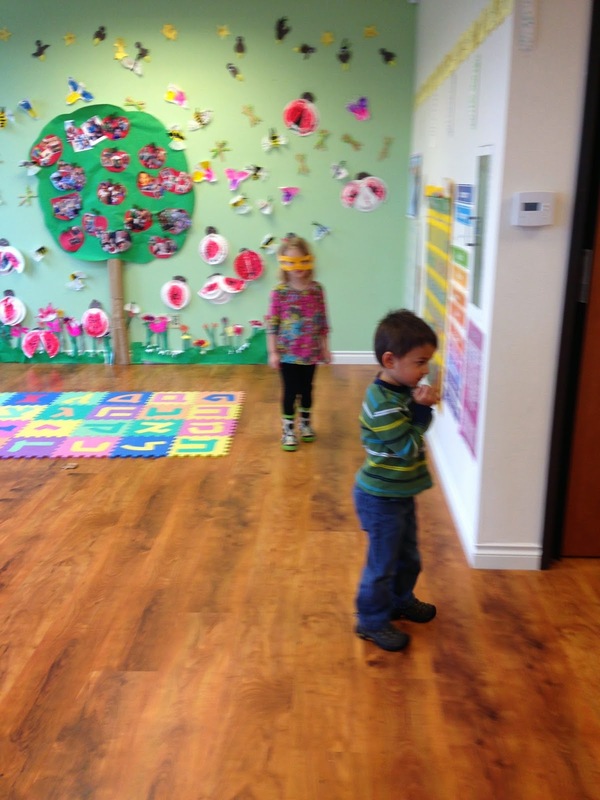 Morah Katie: I think we will just smell the ground up coffee beans at preschool. -Gabriella who lives in the rural countryside and helps her family farm. -Alex who lives in a big city, Sao Paulo, who goes to school and play soccer. -Taki, who is a Karaja Indian. He lives in the Amazon jungle and helps his dad and uncles hunt for food. Taki had an interesting pet. Morah Katie: What kind of pets do you have? Sofia: I have 3 dogs. Gracie: I have Princess and Brother. They are both kittens. Scout: I have a kitty. Morah Katie: Why do you have pets? Scout: I like to pet my kitty. Sofia: They make me smile. Morah Katie: I also have pets, and they make me smile. They can be so silly they make me laugh and feel happy. Our friend Taki has a pet. He has a monkey! Kids: What?!?!? wow... a monkey?!?!? Morah Katie: How do you think Taki feels about his monkey? Gracie: He probably likes it just like we like our pets. Morah Katie: We even have classroom pets. Taki is not so different from us. What do you, Taki, Gabriella and Alex all need to grow up happy healthy and strong? Zim: A house, or shelter. 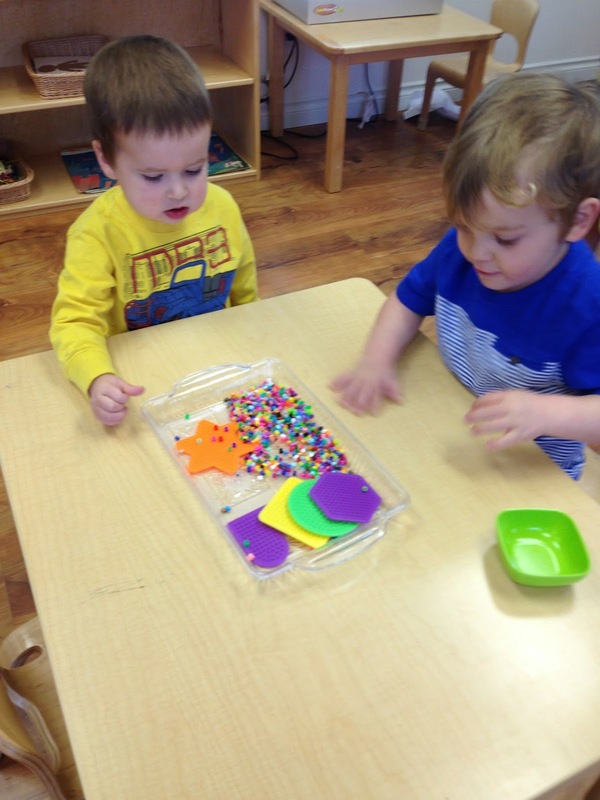 Morah Katie: Toys can be very fun. Can you still have fun without a lot of toys? Morah Katie: If all you had to play with were sticks or pebbles, what could you use to transform them into games or toys? Anton and Scout are slow slow sloths, moving slowly to collect their tzedkah. Morah Katie: What is the most popular game Brazilians play? 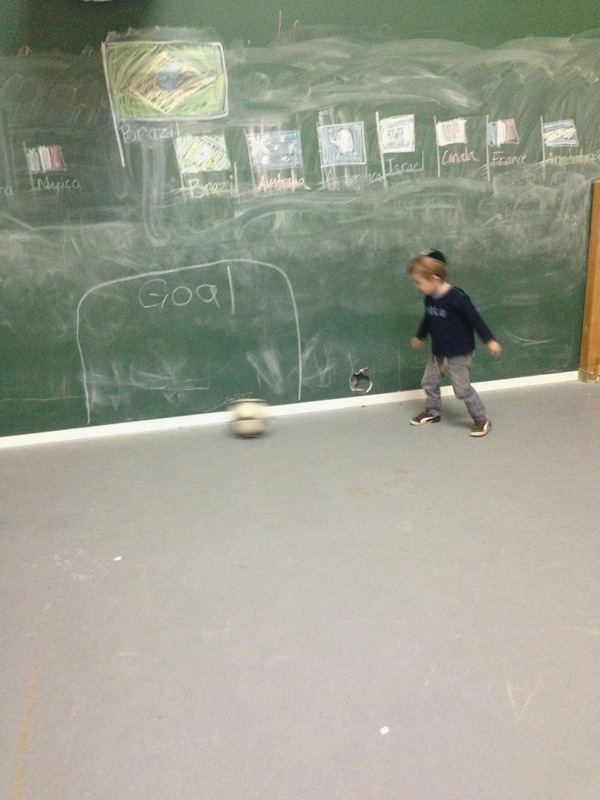 Morah Katie: What do you need to play soccer? need food, shelter and clothing to stay strong, safe and healthy, we began to think back to what the Jewish children in long long ago Egypt might have needed to be strong, safe and healthy. Morah Katie: Tell me, what do you think the Jewish children who were living in Egypt long long ago needed? Morah Katie: Not so different from what modern day children in Vancouver Washington, or Brazil need. 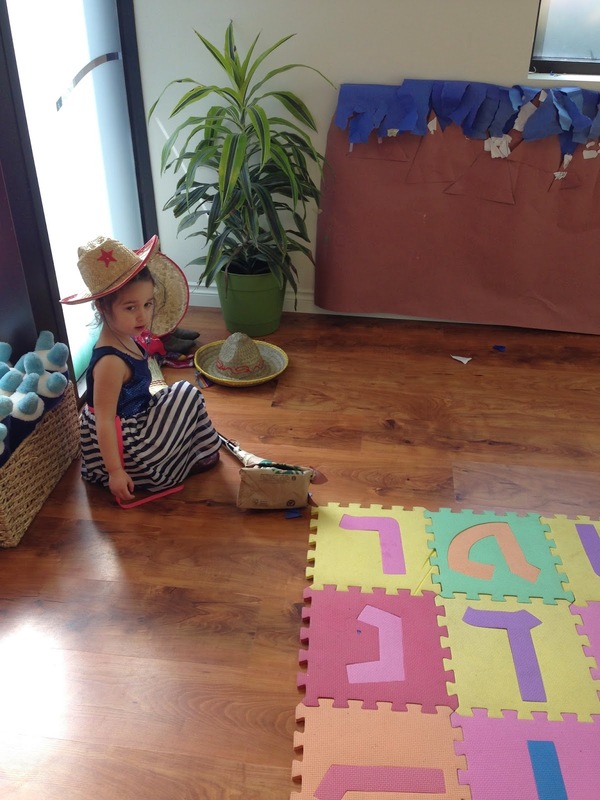 Morah Tzivie began to tell us about our upcoming holiday. Morah Tzivie: A very special holiday is coming soon. Who can tell me the name? 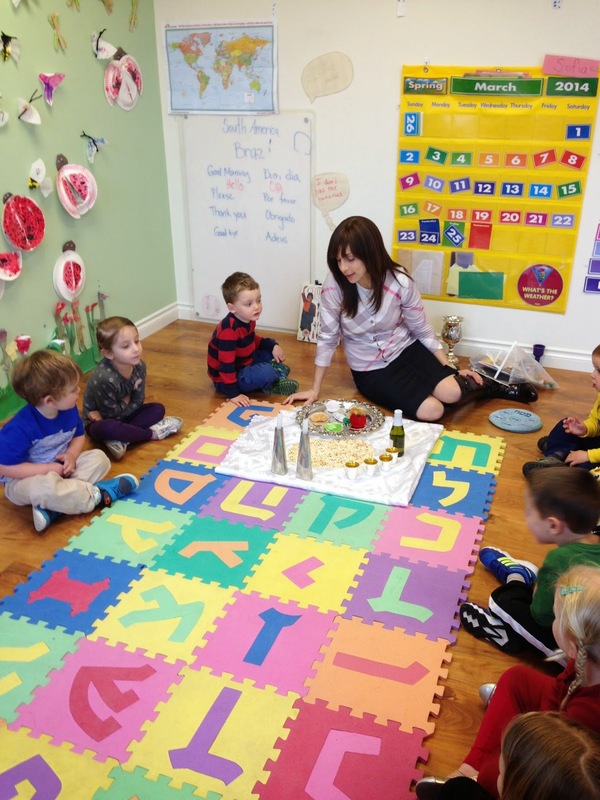 Morah Tzivie: Pesach is the Hebrew name, who knows how to say it in English? Morah Tzivie: Pesach, Passover, is a very different and interesting holiday. Let's begin by setting our Shabbat table. What do we need? 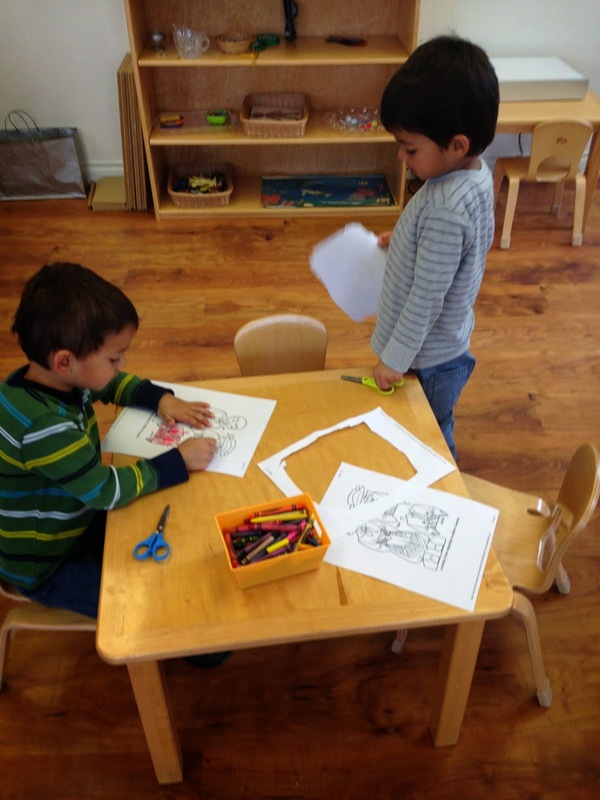 Morah Tzivie: This is our Shabbat table. 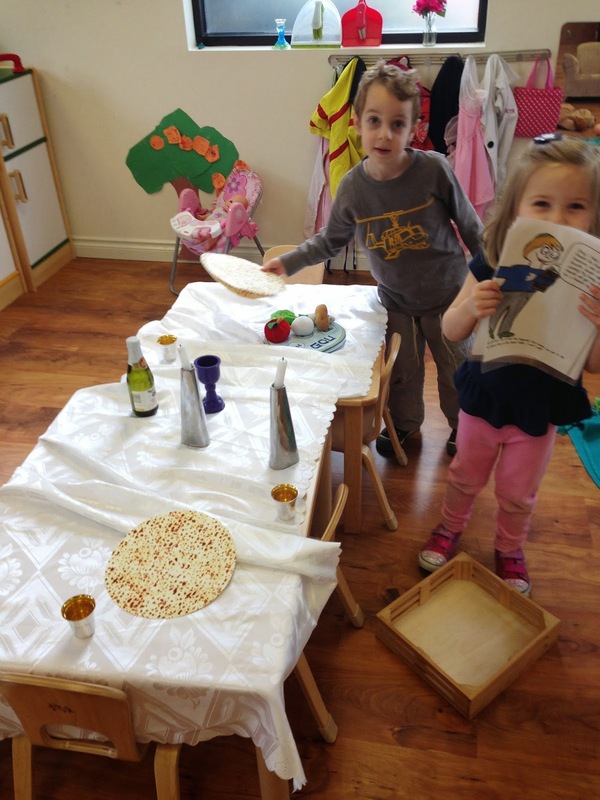 A Passover table looks very different, with lots of interesting things on it. The dinner is called a Seder. First, we do not eat challah at a passover dinner. What do we eat instead? 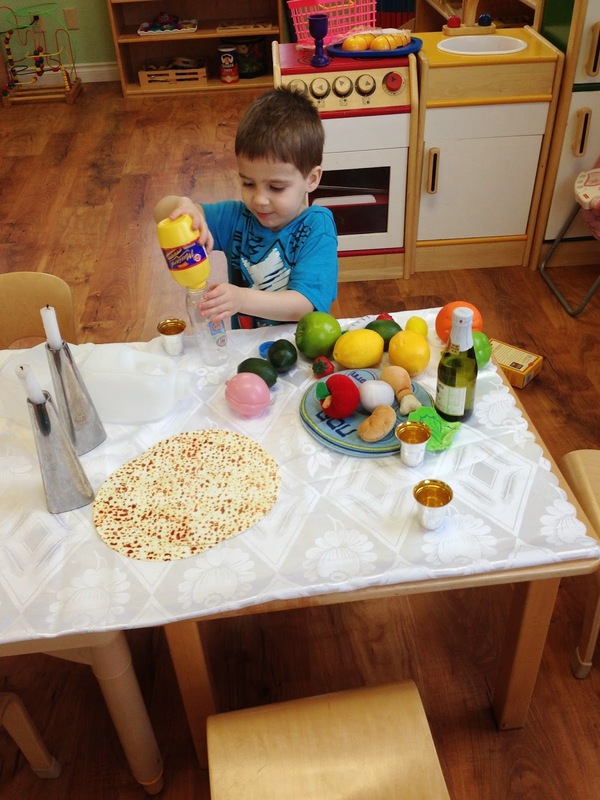 Morah Tzivie: The candles can stay for our Passover meal. 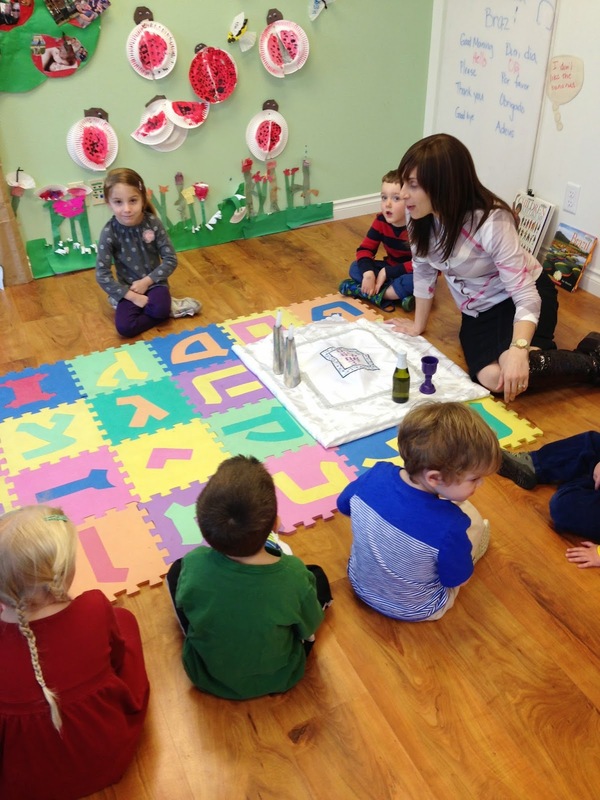 Does our Kiddush cup stay? Morah Tzivie: We keep our Kiddush cup, but guess what? We drink 4 cups of Kiddush. We need 3 more cups. Also, we have this special plate. 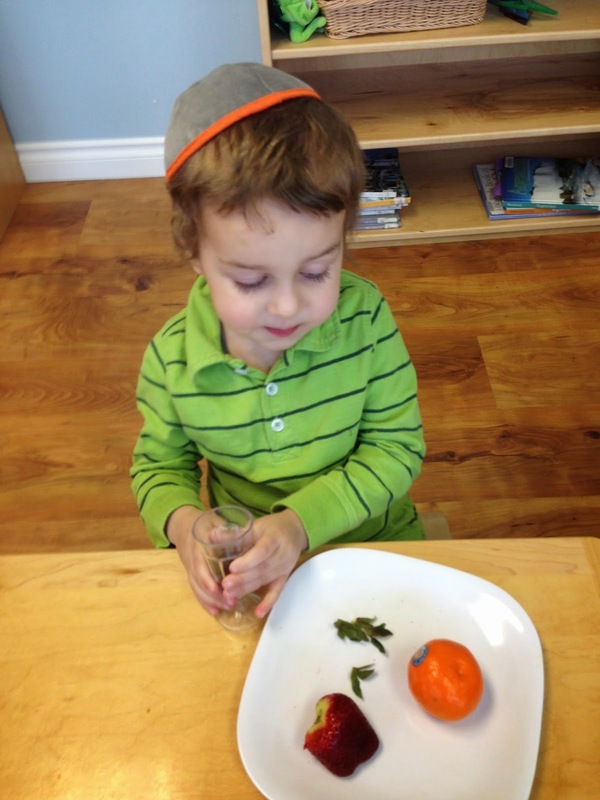 Morah Tzivie: On our Seder plate we have 6 spots for 6 very special and interesting foods. 1 egg, 1 chicken bone, lettuce, charoset- chopped apples, nuts. On our Seder plate we also put maror, bitter herb- it is so bitter it makes our tears come. We also place some potato to dip in salt water. The last thing we need for our Seder table is a very special cup. It is Elijah's cup, we don't see him but he visits every Seder meal. We look forward to learning why we eat such interesting foods, and why a Passover Seder is so different from a Shabbat dinner. Visiting with Rabbi Mordechai and Esther.